What a challenge! As with BobbyC, we went in search of "P-foods" to come up with the "perfect permutation". It was too easy to get caught up in the challenge and get extravagant with the ingredients, but we decided to keep is simple, quick and cheap. The first "P" that came to mind was "pantry". We dove through the cupboards, fridge and freezer to find items we already had on hand. We kept it simple and quick by asking "What would we cook on a weeknight?" * We saved some time and picked up a plain cooked rotisserie chicken from our local grocery store. There's enough meat for two meals, so half went into the freezer. The half we used for this recipe was kept warm in a small skillet with a dash of olive oil. I also added a wee bit of oregano and black pepper. I'm planning a series of 'what to do with a rotisserie chicken' posts, so stay tuned! 1. Fire up your panini press. 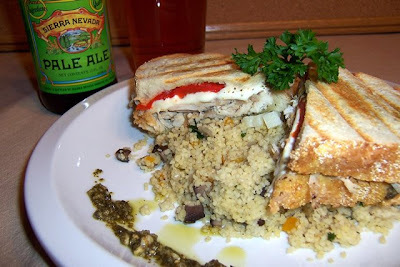 No panini press? Okay, fire up your grill pan, or waffle iron or, in my case, my George Foreman grill (I knew there was a good use for this). Lube the plates up with a bit of cooking spray. If you are using a stovetop grill pan, heat up your cast iron skillet at the same time... you'll see why in a bit. 2. Lay out your bread slices, and spread the pesto evenly on one side of the bread. 3. 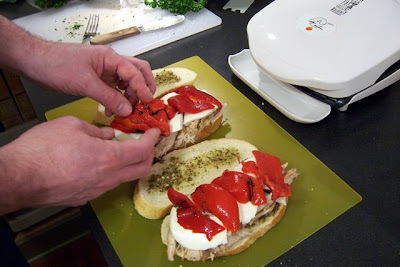 Divide the chicken for two sandwiches, and layer on the mozzarella slices and roast pepper slices. 4. Cap each sandwich with the remaining slices, and press down slightly, so it fits in your grilling apparatus. 5. Once your grilling doo-hickey is ready, place one sandwich in it and close the lid. 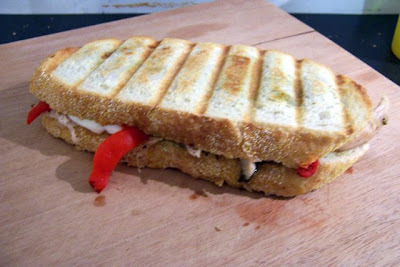 You'll want to weigh the top down a bit to compress the sandwich a bit, and to achieve those really cool grill marks. 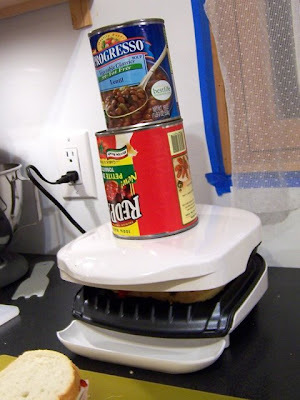 Most panini presses have lids that lock down, but I've found a few heavy cans work for George. If you're using a grill pan, place the sandwich in the middle of the pan, and place your hot cast iron skillet right on top. The heat and weight will achieve the same effect... okay, so the grill marks will only be on one side... so flip the sandwich over! 6. Grill your panini (I think at this point it can be referred to as "panini") for about 3-5 minutes, or until golden brown and delicious. Remove the panini to a cutting board and let it sit for 1 minute. This will give the cheese a chance to set up a bit, and keep your panini together. Serve and enjoy! 1. In a medium sauce pan over low heat, sweat the shallot, pepper and mushroom in the olive oil with a dash of salt. Stir occasionally to keep from burning. 2. 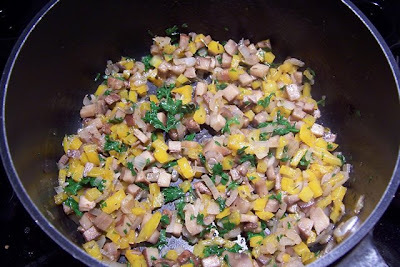 Once the veggies have cooked down a bit (5-10 minutes, or so), add the oregano, parsley, thyme, and season with black pepper. 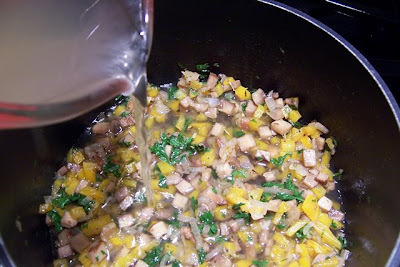 Add the chicken broth and bring to a boil over medium-high heat. 3. 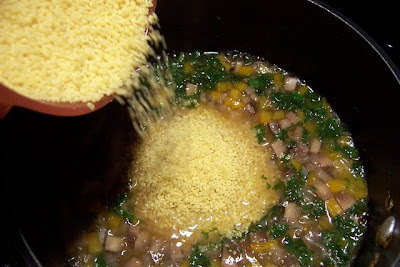 Stir in the couscous, clamp on the lid and remove from the heat. Let stand for 5 minutes. Fluff with a fork before serving. Top with Romano. Oh, did I mention I also made dessert? I guess I'll save that "for another show." A pair of praiseworthy preparations professionally prepared and punctually presented per prescribed parameters. Points posted pending proper perusal. Possibly a poll should be posted to properly perceive public preferences.